A college party needs to be fun, and above all, memorable. 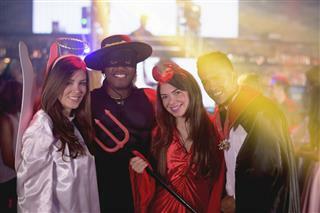 You need a theme, drinks, and even games thrown into the mix if you want it to be a success. Let's take a look at how you can throw a fantastic college party that is sure to be the talk of the town. 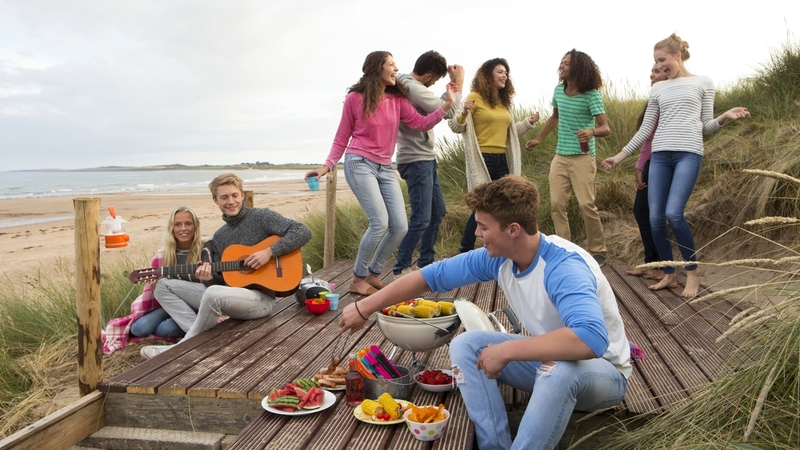 A college party is the highlight of the year for any student, especially if they're about to embark on a journey to adulthood as student life draws to a close. Some colleges throw parties to mark the advent of spring break, ending the semester with a well-deserved celebration. The best moments in college aren't just about the stunts we pulled in class or the friends we made, but the wild parties. Around the US, there are universities that throw some of the coolest parties ever―Washington University in St. Louis, University of Wisconsin-Madison, Cornell University, and the University of Arizona, really know how to party, among other colleges. You're close to becoming an independent adult who has to fend for himself in the world; end it all with a crazy party that is sure to leave you reminiscing about it, years down the line. We show you how to throw a college party by covering the important aspects that need to be included and taken care of, as part of the planning process. The first thing you obviously have to do, is pick a theme; it's got to be something that hasn't either been done before, or a theme that's gone viral online after another university has done it. The best themes we've come across on the internet are ridiculously fun, with no extra thought put into the ideas; it's spontaneity at its best. One particular theme includes costumes―students are told to dress up as their favorite movie star or a wacky character from any genre under the sun, whether from a sitcom, cartoon, or movie. Another theme called 'Thrift Store' caught our attention, where students dress up in cheap, outrageous clothes taken from either a thrift store or their grandparents'/parents' closets. Our favorite theme so far? 'The Seven Deadly Sins'―students come dressed in any one sin they want to emulate through an outfit; it allows students to be creative with their getup. A hilarious theme we came across called 'Snow Pants or No Pants', had students wear snow pants to the party and no other kind; if they were spotted with ordinary pants on, they had to take them off! While the college campus itself serves as the best venue, especially since it doesn't require additional expenses for rent, you'll have to keep in mind the capacity of the party. Are the students from a single batch or is the entire college included? Will the college campus suffice or is there a bigger place to accommodate everyone, like an auditorium? If you need a bigger place to throw the party, explore budget-friendly alternatives like the beach or a park. Be sure that it is a secluded area that keeps outsiders away; the last thing you need is a stranger messing around with a student, or taking advantage of the free food and drinks. Once you work out the issue of space, the next step is to arrange for the necessary party essentials. Security: A team that can handle fights, outsiders, and anything fishy that crops up. A cleanup crew: For after the party. Pamphlets: As a form of advertisement a week prior to the party; include large posters around the campus just in case some people don't receive a pamphlet. 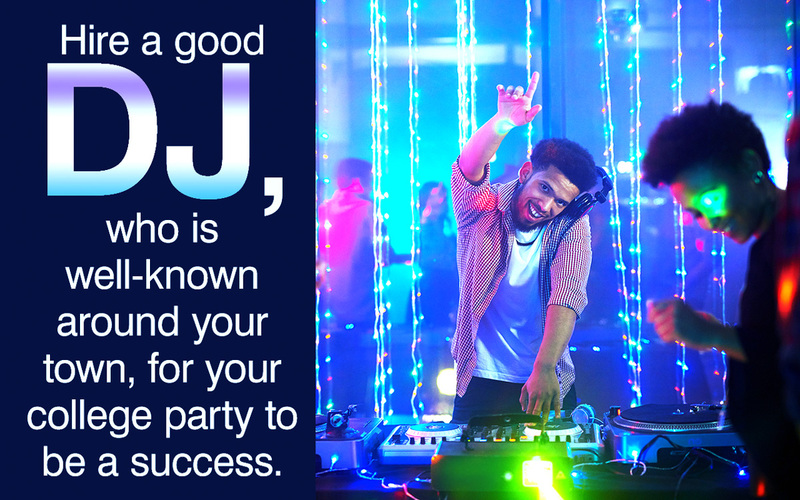 DJ: You'll obviously need someone to take care of the music, so hire a good, affordable DJ that is well-known around your town. Food and Alcohol: We're assuming everyone is above the legal drinking age to indulge in alcohol. Arrange for food from a good catering company and work out a decent budget when it comes to alcohol supply.